Using Microsoft Outlook, you can create rules to reply automatically to incoming messages with the Rules Wizard and Out of Office Assistant. 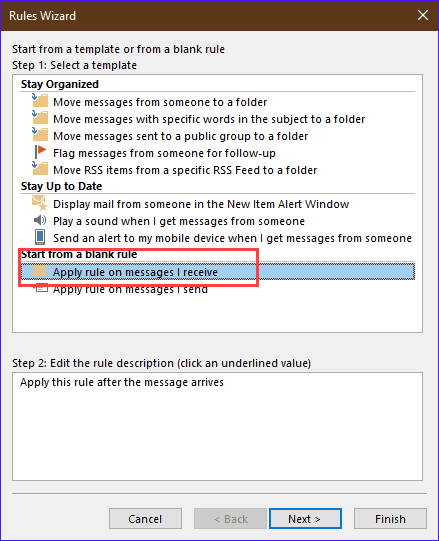 If you don't use an Exchange server mailbox (Outlook.com and Office 365 are on Exchange), you can create automatic reply rules using Rules Wizard but will need to leave Outlook open and collecting email. For this reason, it's usually better to create automatic reply rules on your email server, if supported. "Can I create an "out of office" message if I'm not on a Microsoft Exchange server?" Open a new message and enter your automatic reply message. Save the message using File, Save as and choose Outlook Template (.oft) format. Open Rules & Alerts then tap New to create a rule. Choose Apply Rule on messages I receive to create a blank rule. Click Next. Choose your conditions or click Next to apply the rule to all messages you receive. Tick Reply using a specific template from the Actions list. Click on specific in lower pane then select your template. In the Select Template dialog, choose User Templates in File system at the top. Select your template then click Open. Click Next to add exceptions or Finish to complete the rule. This will only reply to email after Outlook downloads mail. This means you need to leave your computer turned on and Outlook needs to connect to the Internet regularly to check for new mail. It's much easier and safer to set up an automatic reply on your mail server, if your server supports it. (Many do.) Look for the option to create a "vacation reply", as this is the common terminology used on many servers. To use a Run a script rule to emulate an Out of Office reply, see Run a Script Rule: Send a new message when a message arrives or Run a script rule: Autoreply using a template . Using run a script will send a reply with every message that meets the condition of the rule. Automatic replies, formerly known as Out of Office Assistant, is available only if you connect to Microsoft Exchange Server, which includes Office 365, Outlook.com, and on-premise Exchange servers. Automatic replies sends a response (just once) to each message sent to you and also executes other rules that you set up in the Automatic Replies dialog. You should always fill in the response text; otherwise, your correspondents will receive a blank message in return. "I set a rule in Outlook to send an auto response email when any email arrives. This is working fine for internal emails and when I send an email from my another corporate account an auto reply is sent. But when I test it using a Gmail account, I don't receive a response in my Gmail account. " This is typical behavior with Exchange accounts. Most administrators have automatic replies to Internet addresses blocked on the Exchange server. To check the settings, the administrator will look at the default remote domain in Exchange Management Console (under Organization Configuration > Hub Transport). The administrator can create remote domains for domains that should receive automatic replies. Outlook sends just one automatic reply to an address until it is closed and restarted. Outlook does this to prevent a mail loop, where it and the recipient's email client send automatic replies back and forth until one side stops, often because one mailbox is full or the mail server crashes. If you need to send replies to all messages you receive, you'll need to find another solution or use a macro or add-in. If you need to use a rule, use a "run a script" rule. Before creating a reply rule, you need an Outlook template file containing the text and subject of the reply. To create the template, make sure that you are not use Word as your e-mail editor (Tools | Options | Mail Format), because WordMail does not allow you to save messages as Outlook templates. Create a new Outlook message, then add your own subject and text. You can also add Bcc and Cc addresses. Then use File | Save As to save it as an Outlook template .oft file. When you create your reply, you'll be asked to specify the location of the reply template -- that's your .oft file. Rules Wizard replies are a client-only function, because they depend on the .oft file. If you use Exchange Server and want replies to run from the server, you must disable Rules Wizard and use Inbox Assistant instead. Only one reply per address is sent, no matter how many times someone sends to you. This means that Rules Wizard replies actually work like the Out of Office Assistant replies. However, it also means that, when you're testing reply rules by sending to yourself, you must exit Outlook and then restart. Otherwise, after the first test, you won't see any replies to other messages you send yourself. If you want the replies to go out automatically, say while you're on vacation, you need to leave Outlook running and make sure that it is set up to send and receive messages automatically. The Folder Assistant for Exchange Server public folders, found on the folder's Properties dialog, can create many of the same types of rules as Inbox Assistant. In an Exchange Server environment, automatic forwarding and replies to the Internet may be disabled at the server level. Consult your Exchange administrator if automatic replies are working to internal recipients, but not those one the Internet. Replies are sent to the original sender of the message. Outlook ignores any Reply To address. In Outlook 98 and Outlook 2000 in Corporate/Workgroup mode, automatic replies are not saved to the Sent Items folder. Outlook provides no way to quote the original text of a message in an automatic reply rule. For that, we have used Email Templates, which can operate in rules as a custom action (except in Outlook 2002). Email Responder plug-in for Microsoft Outlook is an out-of-office assistant. Auto reply with away message templates; change your status and reply templates remotely. Change or schedule your free-busy status manually (Away, Out of Office, Vacation, Tentative, Custom) or use you Microsoft Outlook Calendar or Skype availability status. Auto response to selected Contacts or Distribution lists only. Enable Microsoft Outlook auto forward. Windows 10 and Outlook 2016 support. AutoReply 365 works with Office 365 and has the following features: The subject line of autoreply message consists of "Autoreply:" prefix and the Subject line of original message. The body of autoreply message includes the original message text. You can set any From: address for autoreplies. You don't need to create a shared mailbox for autoreplies. AutoReply Flow checks the original message for a Reply-To: address field. If one is found then an auto-reply message will be sent to this address. If an original message has no Reply-To: address field then an auto-reply message will be sent to the From: address of the original message. The subject line of the auto-reply message consists of the prefix ("Confirmation:", "Autoreply:" etc) and the Subject line of original message; the body of auto-reply message will include the original message text. Exchange/Outlook add-on to create custom replies, forwards, signatures -- inserting any type of boilerplate text into your message. Templates are stored in Outlook or Exchange folders and can contain scripting elements (in VBScript or ET's own script language) to build replies that use information from the incoming message. Various extensions can handle such tasks as mailing list subscriptions. For a rotating quote, download the Rotating Text template. Has some issues with Outlook 2002 -- make sure you get the latest update, disable RTF templates, and don't try to use ET as a custom action in Rules Wizard. Mail organiser for Outlook to replace the built-in Rules Wizard. Offers unlimited rule capacity (only limited by your computer hardware), quick folder find, attachment renaming, and Bayesian antispam mail filtering. Hi, I was wondering if anyone knew whether or not you can set up a rule for a subfolder in outlook to forward the mail you put in that folder . I recieve a mail in Subfolder 1, and I drag and drop it into Subfolder 2. Then I want that mail that I dropped in Subfolder 2 to be auto-reply to a specific email adress. You cannot use a rule for this but you can use an itemadd macro to watch for new messages in a folder and do something. I have more information in this article and links at the end of the articles to more samples. can anyone help me . i am looking for a help . i am in need to make a auto reply to users when i move a mail from A subfolder to B subfolder in inbox . please guys help as it is very urgent requirement. You’ll need to use an item as macro to watch the folder - this sample will give you an idea how to do it - change the section that deletes to code that sends a reply. Hi Diane, we have a problem sending out Auto-reply to external emails because when it is being sent, the sender becomes empty as per exchange RFC compliance. For that reason, our smarthost security system is blocking the auto-reply message. My question is how can we make our auto-reply contain a sender when sending out. Or how can we make outlook auto reply using a template but not client-only? Because we do not want our Outlook open all the time just to activate Auto-reply. What version of Exchange are you using? Do you need a template? You can create server-side reply to reply with a specific message. I have a user going away for a few weeks. She's using Outlook 2016 with Exchange (O365) and we'd like to set up an out-of-office only to persons in her contacts or suggested contacts list. I don't want her to auto-reply to ALL emails, but she doesn't properly use her contacts list, hence the need to use the suggested contacts list too, as a filter. Using either the assistant or rules, I cannot see a way to do this, as the suggested contacts list doesn't appear as an option in those dialogue boxes (even though it shows in Outlook and O365 "People"). Is there a way around this? Or if we filter based on her contacts, does this automatically include suggested contacts (can't find anything on net to say so...)? Hi Diane. Is there a way to set a rule to respond to all emails with a greeting but only do it once a day (in Outlook 2007)? I would like to set a rule to reply to all emails that I only check my emails 2 -3 times per day. I have been able to set rule to do that but the message is sent each time i receive an email from the sender. This frequency drives people nuts (uderstandably). no, not easily. You'd need to use a run a script rule and search the inbox for each message and verify no messages arrived within the last 24 hours. I need to make some sort of rule that will auto-reply to any junk mail that comes from a particular domain but nowhere else. I am getting unwanted mail from this domain but I may also get wanted mail from some people in this organization. I have tried to get off their mailing list but can not. So I want to set up something to auto-reply with a message like, "If you are receiving this it is because you are emailing me from ____ and I blocked all mail from that domain because they refused to remove me from their mass mailing lists. Please e-mail me from another address/domain." Honestly, that never works and if it's a true spammer (and not just a company with a bad unsub feature) could make you a target. It's better to make a rule to delete the mail and be done with it - or if your mail server supports it, create a rule on the server to delete mail from that domain. Hi Diane Poremsky, I'm using outlook 2010. Just set up my auto reply for vacation week. Do I need to leave my computer booted and outlook running for the week while I'm gone to enable the auto reply email to function? Outlook's 'out of office' feature will replay when outlook is closed, but it only works if you are using exchange server.